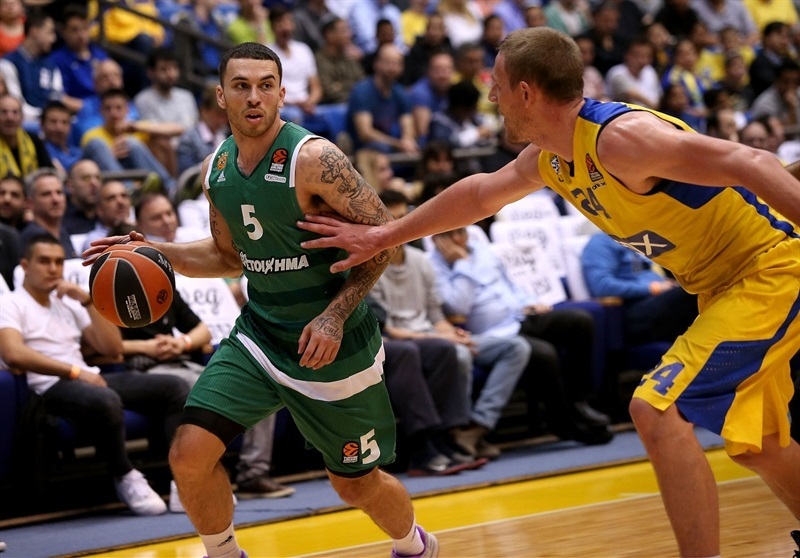 Panathinaikos clinches fourth place with second-half surge! 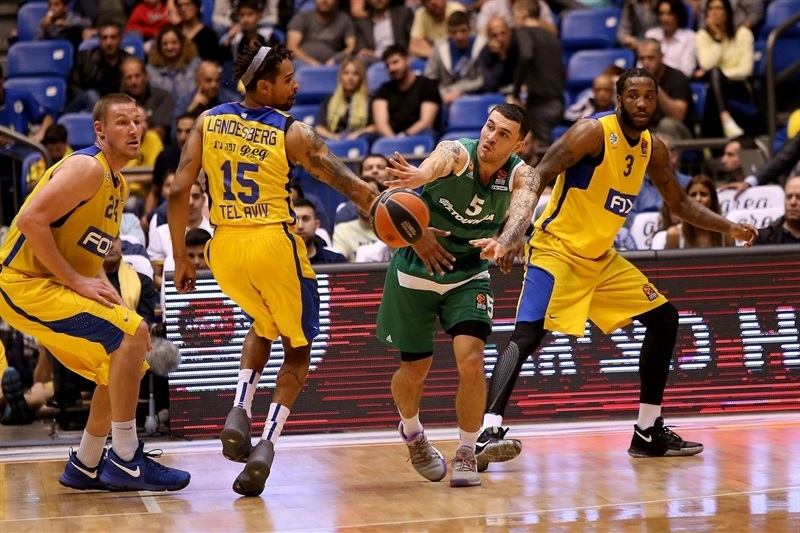 Panathinaikos Superfoods Athens waited 20 minutes before putting a lock on fourth place and home-court advantage in the upcoming playoffs with a 61-81 road win over eliminated Maccabi FOX Tel Aviv on Thursday. 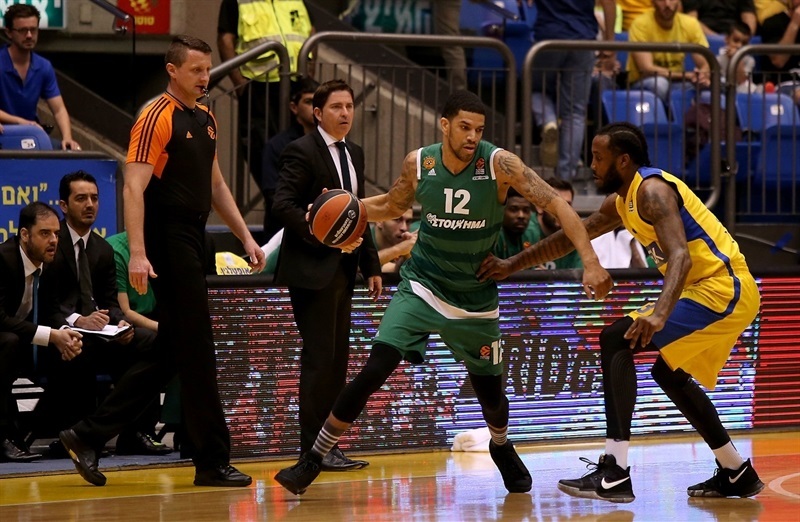 The Greens finished the regular season at 19-11, while Maccabi dropped to 10-20 to close its Turkish Airlines EuroLeague campaign. 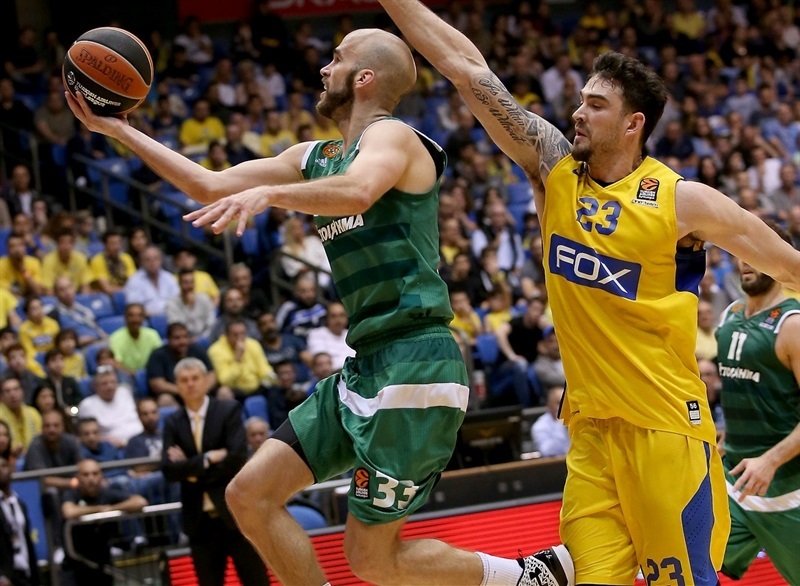 Panathinaikos flirted with disaster as Maccabi vaulted in front 45-32 on the first basket of the second half. But after that, the Greens flipped a switch, using an 11-0 run to spark a 16-49 finish to the game. Mike James led the winners with 17 points, all in that second-half splurge. Chris Singleton had 13 points, 8 rebounds, a career-high 6 steals and 2 blocks, with Nick Calathes scored 12. 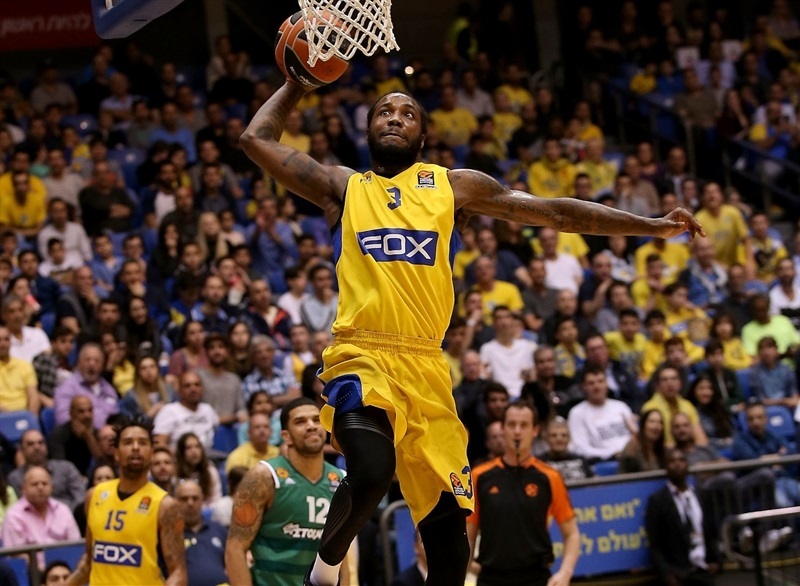 Maccabi got 17 points from Victor Rudd and 14 from Joe Alexander, who hit 4 three-pointers each. Gal Mekel dished a career-high 9 assists but coughed up 7 of his team's 16 turnovers. 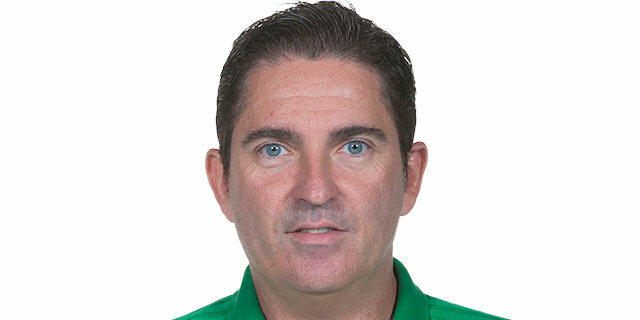 Panathinaikos went 1 for 15 on three-pointers in the first half and made 9 of 18 in the second. Singleton and Calathes made layups for the visitors while Alexander did so for Maccabi before a triple by Rudd made it 6-4. Calathes tied it but Rudd went long again and Diamon Simpson followed up a fastbreak miss at 11-6. Demetris Nichols and James Gist joined the scoring for the visitors, as did Mekel for Maccabi before Alexander dropped a corner triple at 16-10. Gist found Nichols for a sweet reverse and Singleton scored twice in close to make it 19-16. Dueling dunks by Rudd and James Feldeine were followed by Alexander landing another triple at 24-18. 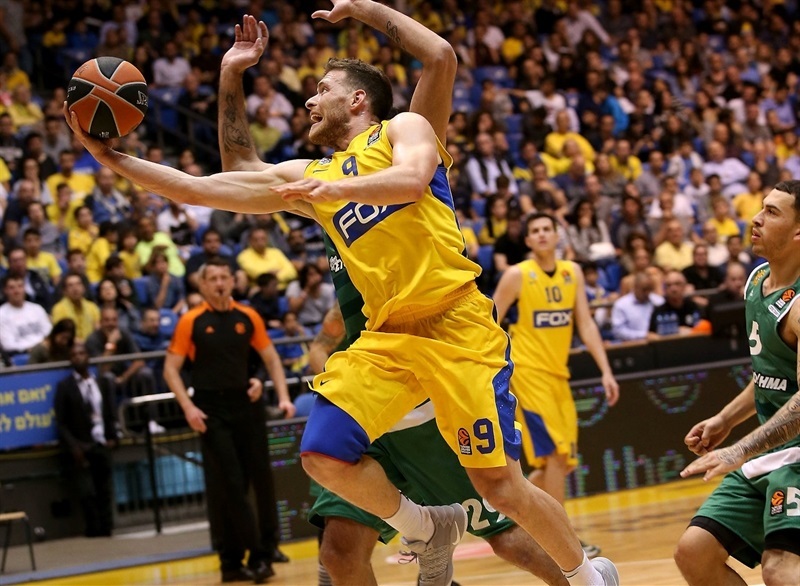 Feldeine's fastbreak was answered by Colton Iverson downing his second basket off an offensive rebound for a 26-20 Maccabi advantage after 10 minutes. Ioannis Bourousis tipped a pass through the basket at one end and Mekel found Guy Pnini cutting at the other to start the second quarter. Bourousis kept it going and K.C. Rivers hit his team's first three-pointer. A Bourousis dunk was met by Rudd's third triple and a pull-up jumper at 36-31. 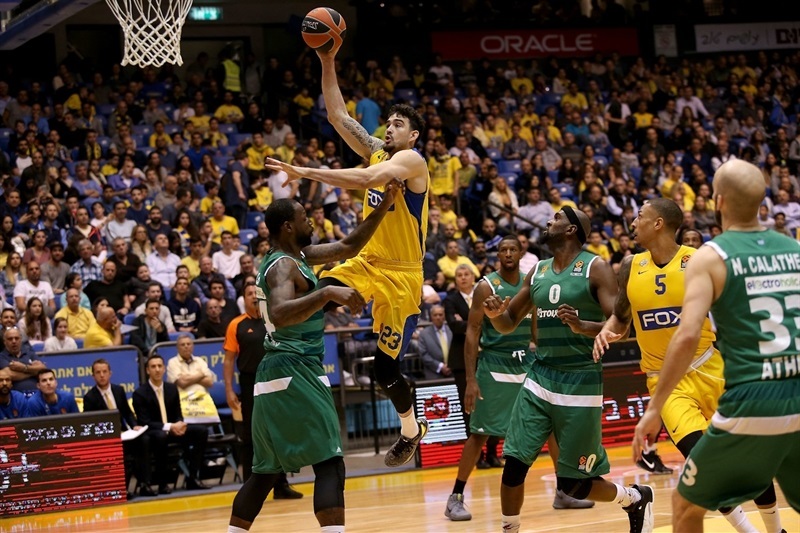 Free throws by Mekel and Iverson gave Maccabi its biggest lead yet, 39-32. But the hosts weren't done and found Nimrod Levi right before the first-half buzzer for a banked-in triple and the game's first double-digit margin, 42-32. 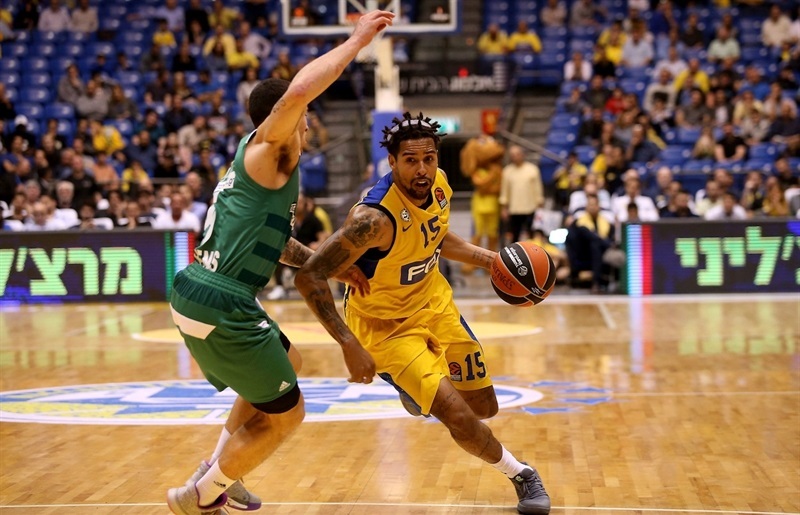 The threes kept dropping for Maccabi as Alexander's third extended the difference, but only until Kenny Gabriel answered him from the arc and Calathes hit a two-point jumper at 45-37. 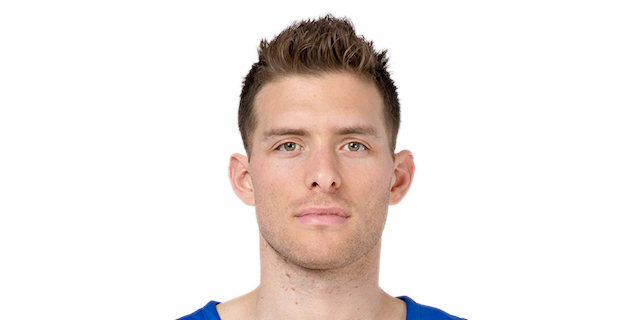 Alexander was back with a shot from the corner, restoring the double-digit difference, but again that inspired a Panathinaikos shooter, James, who next gathered up a steal by Singleton and went the other way for a dunk. Calathes turned another turnover into a layup and then Singleton's block led to Nikos Papaps drilling from deep. 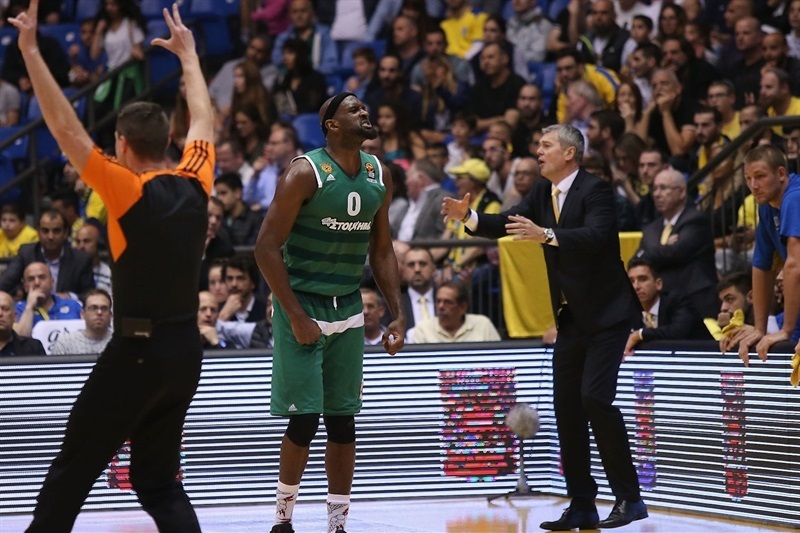 When Singleton himself joined the shooting party, suddenly the Panathinaikos run was 11-0 and the visitors led 48-51. Rudd answered with his fourth triple, but James busted out with 2 layups around another three-pointer as Panathinaikos zoomed ahead 51-58. Another Maccabi turnover sent Gabriel flying in for a dunk before Pnini and James finished the quarter from downtown as Panathinaikos took command of the scoreboard, 54-63, after 30 minutes. 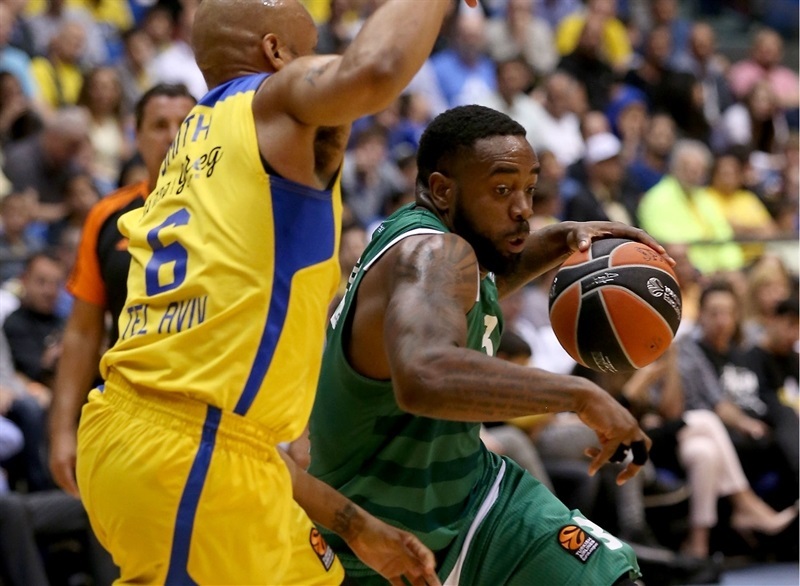 Singleton and Rivers kept the triples falling in the fourth quarter as the Panathinaikos scoring run reached 6-33 and the difference ballooned to 54-72. 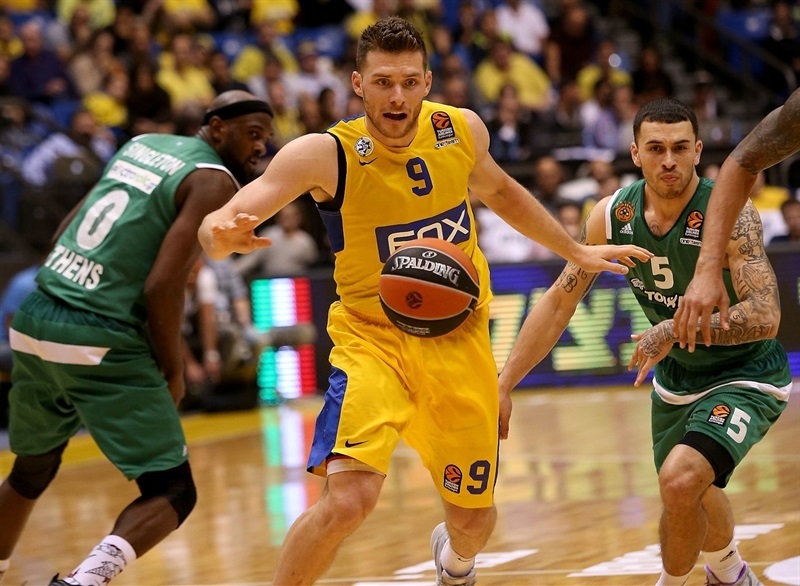 Pappas was the next three-point striker and Singleton kept blocking shots and making steals to demoralize Maccabi's offense. There was little movement on the scoreboard after that as Panathinaikos held onto a 61-81 victory that looked impossible by that margin 20 minutes earlier, but assured the visitors would start the playoffs at home in less than two weeks! "We collapsed in the second half. We tried everything – timeouts, switching defenses – but it didn't help. A team needs to be healthy physically and mentally and we just were not. I feel bad that's how it ended. 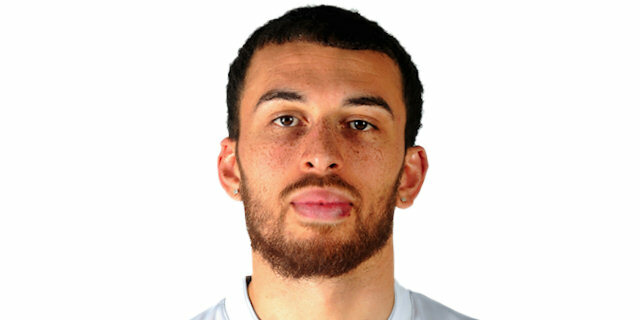 We don't have a lot of time, but we hope to get stronger for the Israeli League." "It's very clear that without defense, it's impossible to feel the game. The first 20 minutes, we didn't play defense at all. This is why even on offense we didn't score. I think it was clear. In the second half, we started to feel the game on defense. We didn't score on offense, but we started, at least. And after this we played better and better offense and defense and we got the win. Home-court advantage in the playoffs is important for sure. We are very happy that we will play in front of our people, our supporters. For sure this is important for us, but the most important thing will be to play well." "What happened against Panathinaikos reflects our whole season. We started with a great first half and then just didn't show up for the second. We don't know why, but that's what happened all season long. 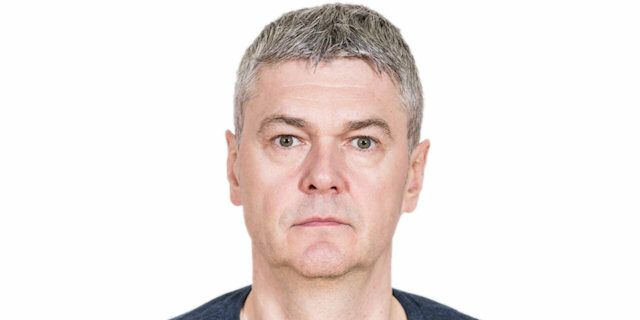 We will now turn strongly to the Israeli League." "I think we just woke up. In the first half, we had no energy and let them do what they wanted. In the second half, we played our style. We played defense, got out and ran, and we made shots. Home-court in the playoffs was one of our goals going into the season. Now, we've got it, so we have to move on to our next goals and keep pushing."